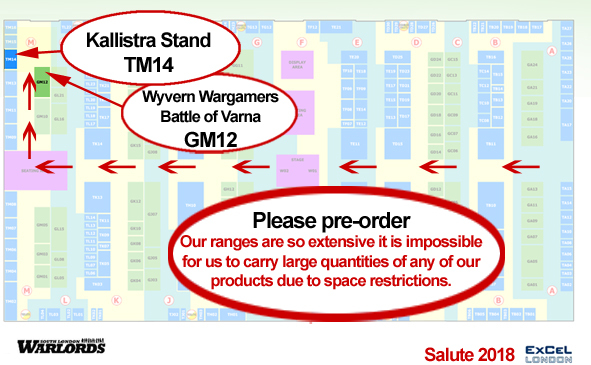 Salute 2018 is on Saturday 14th April at the Excel Exhibition centre in London. Please have your pre-orders to us by Monday 9th April. Please to avoid disappointment, remember to pre-order your goodies. Our ranges are so extensive it is impossible for us to carry all our products or large quantities of any of our products due to space restrictions. Our WW1, ACW and AWI together with the Hordes & Heroes Historical and Fantasy ranges and Hexon Terrain system are very popular, and despite our best efforts, will always run out of stock of some items very quickly on the day. So PLEASE, if you’re going to SALUTE and you know what’s on your Kallistra shopping list, place your order in advance, we will bring your order along so you can collect it at your convenience, at some point during this very busy day.